It can be hard to keep up with all the major voice assistants - Google Assistant, Siri, Cortana, Alexa, the list goes on. SoundHound, perhaps best known for its music recognition app, has been working on its Hound voice assistant since 2015. At CES, SoundHound announced they have partnered up with Onkyo and Shenzhen to produce Hound-powered speakers and robots, respectively. Details on the Onkyo speakers are essentially non-existent at this point. The speakers will be branded as Onkyo, and become available globally (including in the US) later this year. The more interesting announcement is the Robot LQ-101, built by Shenzen and running the Hound assistant. The LQ-101's appearance seems to be a blend of EVE from Pixar's WALL-E and Baymax from Disney's Big Hero 6 (in fact, the file name for the above image on the press release is 'Houndify_Baymax.jpg'). The robot can respond to verbal commands, such as "come here," "rotate," or "dance." It also has some practical uses, such as initiating voice calls on its built-in touchscreen and monitoring carbon monoxide levels. Much like developers can add new functionality to Alexa, SoundHound is pushing its Houndify developer platform. Developers can use it to create new abilities for Hound, such as the robot-specific commands on the LQ-101. It remains to be seen if Hound can make a dent in the ever-competitive voice assistant market. LAS VEGAS--(BUSINESS WIRE)--SoundHound Inc.®, the leading innovator in sound recognition and voice-enabled conversational intelligence technologies, and Shenzhen Tanscorp Technology Co., the leading Chinese robot developer and manufacturer, today unveiled Robot LQ-101, an intelligent family service robot powered by SoundHound Inc.’s Houndify™ voice-enabling conversational intelligence developer platform. Robot LQ-101 will be on display at Shenzhen Technology Co.’s booth at CES from January 5 - 8, 2017. It can be found in Booth #44545 at Sand Hall A-D at the Las Vegas Convention Center. 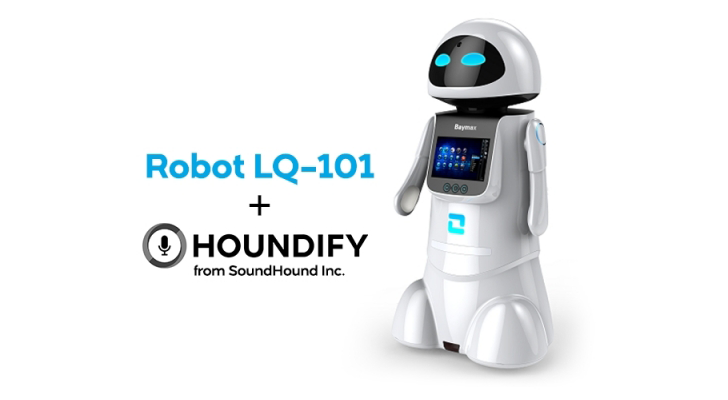 With the Houndify integration, LQ-101 features powerful voice recognition and information services capabilities, and families can speak to the robot naturally to receive answers about weather, sports, stocks, flights, hotels, restaurants, music, general knowledge and more. Additionally, LQ-101 responds to various voice commands to control and interact with the robot, such as requests to “come here,” rotate, dance, make specific faces, or perform kung fu. LQ-101’s high-definition video calls help families maintain relationships with long-distance loved ones, while its indoor automatic cruising, facial recognition, and carbon monoxide monitoring allow it to play the role of smart home guardian. The device also includes support for smart home control, multimedia playback and more. SoundHound Inc. introduced the Houndify platform in 2015, with the mission of bringing A.I. to everyone. About 20,000 partners signed up within a year, including Foxconn, Samsung, NVIDIA and Rand McNally, and hundreds of distinct products are being Houndified. Houndify is the only A.I. platform that is fully independent and agnostic, which means business owners like Shenzhen Tanscorp Technology Co. can deploy it anywhere and stay in control of their brand, users, and data, while differentiating and innovating. Houndify provides all the technology ingredients, including very fast speech recognition, sophisticated natural language understanding, and easy to use developer tools. This gives Houndify unparalleled speed-to-market and the ability to scale, and includes an ever-expanding set of domains, which are programs that provide users with relevant information or actions related to their queries. The platform also provides access to knowledge and data from partners including Uber, Yelp, Expedia and more. Houndify is already featured in SoundHound Inc.’s mobile apps, Hound, the voice search & assistant app, and SoundHound, the music search, discovery and play app, making them hands-free and voice interface enabled. Developers interested in exploring the Houndify platform can visit Houndify.com to learn more and register. The Hound voice search and assistant app is available as a free iOS or Android app, and can be downloaded via SoundHound.com/Hound. For more information on Shenzhen Tanscorp Technology Co., visit Tanscorp.com. SoundHound Inc. turns sound into understanding and actionable meaning. We believe in enabling humans to interact with the things around them in the same way we interact with each other: by speaking naturally to mobile phones, cars, TVs, music speakers, and every other part of the emerging ‘connected’ world. Our consumer product, Hound, leverages our Speech-to-Meaning technology to showcase a groundbreaking smartphone experience, and is the first product to leverage and showcase the Houndify platform. Our SoundHound product applies our technology to music, enabling people to discover, explore, and share the music around them, and even find the name of that song stuck in their heads by singing or humming. Through the Houndify platform, we empower developers to be part of the Speech-to-Meaning revolution. Our Mission: Houndify everything. Shenzhen Tanscorp Technology Co. Ltd.'s mission is to improve the quality of life of all mankind. Since its establishment, the company has formed a strategic cooperative partnership with the China Academy of Telecommunication Research, Chinese Academy of Sciences and South China University of Technology, providing intelligence robot customization services, including global cloud infrastructure, multi-language voice interaction, multi-OS compatible systems, multi-user video conferencing, emotion recognition, face and voice recognition, remote monitoring, tele-operation, intelligent scene control, indoor positioning and navigation, and system integration. The company is also committed to a variety of industry scene application development. LAS VEGAS--(BUSINESS WIRE)--SoundHound Inc.®, the leading innovator in sound recognition and voice-enabled conversational intelligence technologies, today announced a global partnership with Onkyo, a worldwide leader in high-end consumer audio products. The two companies will co-develop and market Onkyo’s next-generation series of smart speakers, which will be powered by SoundHound Inc.’s Houndify™ voice-enabling conversational intelligence developer platform and will be launched later this year. The first series of products will consist of smart speakers released under the Onkyo brand and will be available globally, including across North America. With this partnership, Onkyo may decide to extend the collaboration to other brands in the corporate portfolio. With the Houndify integration, Onkyo smart speaker users will be able to talk to their products naturally to control them and receive answers about weather, sports, stocks, flights, hotels, restaurants, music, movies, and more.SoundHound Inc.’s decade of expertise in music search and discovery, plus its current leadership in voice search and natural language processing, combined with Onkyo’s history of producing high-end audio equipment, delivers an unprecedented music discovery, content navigation, and consumption experience. SoundHound Inc. introduced the Houndify platform in 2015, with the mission of bringing A.I. to everyone. About 20,000 partners signed up within a year, including world-renowned players in variety of industries, and hundreds of distinct products are being Houndified. Houndify is the only A.I. platform that is fully independent and platform-agnostic, which means business owners like Onkyo can deploy it anywhere and stay in control of their brand, users, and data, while differentiating and innovating. Houndify provides the A.I. technology ingredients, including very fast speech recognition, sophisticated natural language understanding, and easy to use developer tools. This gives Houndify unparalleled speed-to-market and the ability to scale, and includes an ever-expanding set of domains, which are programs that provide users with relevant information or actions related to their queries. The platform also provides access to knowledge and data from major service provider partners. Houndify is already featured in SoundHound Inc.’s mobile apps -- Hound, the voice search & assistant app, and SoundHound, the music search, discovery and play app -- making them hands-free and voice interface enabled. Developers interested in exploring the Houndify platform can visit Houndify.com to learn more and register. The Hound voice search and assistant app is available as a free iOS or Android app, and can be downloaded via SoundHound.com/Hound. For more information on Onkyo, visit OnkyoUSA.com. Since 1946, Onkyo has been passionately committed to developing audio products that deliver uncommon performance, quality, and value. Bundling proprietary technologies and innovations with other sound-enhancing exclusives, Onkyo continues to create award-winning products that are lauded by industry-leading publications. The company's philosophy is to deliver products that are superbly designed and built to a consistently outstanding standard of excellence. The results can be seen in the obvious quality of any Onkyo-manufactured product, even before it’s turned on. For more information, visit the Onkyo website at onkyousa.com.